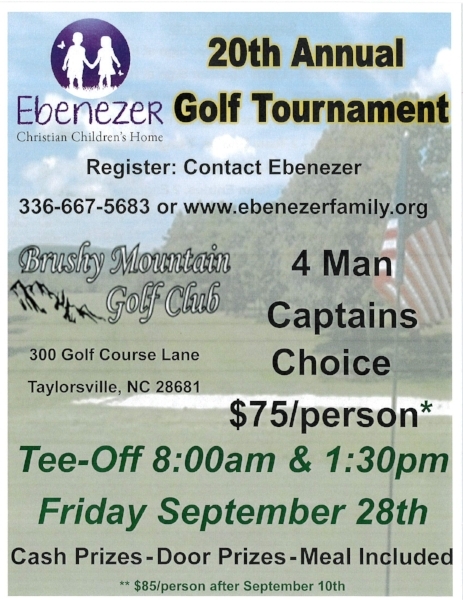 Ebenezer's 20th annual golf tournament will be held Friday, September 28th at Brushy Mountain Golf Club. There will be cash prizes, door prizes, and a meal included. Tee-off will take place at 8:00am and 1:30pm. Four man team, captain's choice. To register, please contact our office either by phone (336-667-5683) or through our website. Registration fee is $75/person before September 10th, or $85/person after September 10th and can be paid by check or through PayPal by clicking here. Please indicate in the memo line that your payment is for golf registration. We are excited for you to join us!